The strange, sentient waters that pass through literature's eerie canal bring news of Edgar Allan Poe and scarce and spectacular Poe first editions coming soon to auction via Sotheby's-New York Library of an English Bibliophile Part II sale, October 20, 2011. Their rarity, condition, and estimated prices will leave your tell-tale heart beating long after you've died from shock; the chances of seeing similar copies of these books within our lifetime are slim and nevermore. These are insanely rare books and highly desirable. "Here begins the detective story" (Grolier American 100). "...the first important book of detective stories, the first and the greatest, the cornerstone of cornerstones, the highest of all high-spots..." (Queen's Quorum). 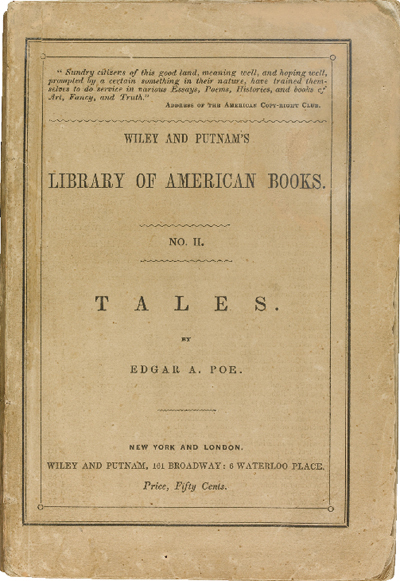 A first edition, first printing, first issue of Poe's Tales (1845) in the original wrappers is the first star to shine. In miraculous condition, it is estimated to sell for $200,000 - $250,000. It's the pits when the pendulum swings so high but copies in this condition are beyond scarce. The Behrman copy, the last to come even close, exhibited loss at head of spine, an old repair along the front joint, the rear joint was partly split, it showed some soiling, possessed a chip to the upper blank margin of the Contents leaf, with pages 57-64 displaying a few chips from careless opening, sold at Christie's New York, June 12, 2008 for $110,000. Condition, the imp of the perverse in book collecting, remains everything. The serious and seriously monied Poe collector is sure to be bitten by the gold bug. Tales was originally issued in a print run of at least 1500 copies but in three variants (bound in cloth, wrappers, and bound together with The Raven and Other Poems) so it is difficult to ascertain just how many copies in wrappers were originally released. What we do know is that there are perhaps only six copies in the full original wrappers extant. This, the Litchfield copy, appears to be the best surviving copy. The last time it came to auction was in 1990 when it sold at Sotheby's for a mere $45,000. What a difference twenty-one years makes. Upon its original publication it sold for 50¢. What a difference 166 years makes. Poe's royalty was 8¢ per copy in whichever format. He earned at least $120 but probably not much more. Not much difference 166 years makes to the average writer today. "The most important volume of poetry that had been issued up until that time in America" (Allen). The Raven "made Poe's name known both in America and England and brought him an immortality that by no other means could he have attained...[and it] gave him fame as a poet such as no other American had received" (Robertson). A first edition, first printing, in wrappers of The Raven and Other Poems (1845) flies into the sale room and perches at an estimated $140,000 - $180,000. It, too, is in miraculous condition. "It is one of the American books of the period most difficult to find with the wrappers intact" (Heartman and Canny). The William E. Self copy, it was last seen at Christie's-New York, December 4, 2009, where it sold for $150,000. It, too, appears to be the finest copy extant. The original edition (again with variants in cloth, and bound together with Tales) was intended to be only 750 copies "but almost immediately a much larger number of copies was issued" (Heartman and Canny). It originally sold for 31¢. 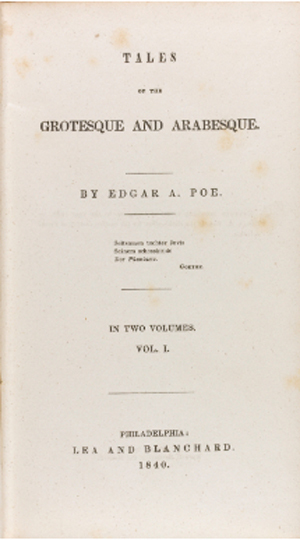 A splendid first edition of Poe's first collection of stories, Tales of the Grotesque and Arabesque (1840), one of 750 sets originally issued, represents another descent into the maelstrom of the auction room at an estimated $30,000 - $40,000. This groundbreaking volume contains the masterpieces, The Fall of the House of Usher, Ligeia, and Ms. Found in a Bottle. "These volumes mark the culmination of Poe's effort, beginning as early as 1834, to get his prose tales into volume form. It was a milestone in his career as a prose writer but was a failure commercially" (Heartman and Canny). "This edition was not exhausted during Poe's lifetime. Copies have been found carrying a title-page dated as late as 1849. Evidently they were issued only as sold" (Robertson). This copy bears a vintage bookseller's ticket from Books Inc. of San Francisco on the lower pastedown endpaper of volume one. A price of $115 is written in. 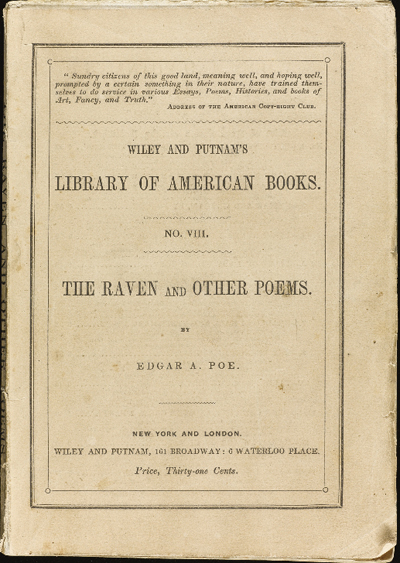 Other notable Poe firsts at this Sotheby's sale include the first English edition of The Narrative of Arthur Gordon Pym (1838), estimated at $3,000 - $5,000; the first appearance of The Raven, in The American Review (Feb. 1845), estimated at $8,000 - $12,000; and a copy of Tales (second printing) bound with The Raven... (second American issue) released in 1846, estimated to sell for $20,000 - $30,000. Sotheby's Library of an English Bibliophile Sale Part II is the first ripe book auction of the Fall season, with many other notable volumes featured. Booktryst will talk about a few other incredible first editions in the English Bibliophile's library prior to the sale. POE, Edgar Allan. Tales. New York: Wiley and Putnam, 1845. First edition, first printing (with Ludwig's imprint on the copyright page), first issue (with the New York imprint). Octavo (189 x 127 mm). [Initial blank leaf]; [i, half-title, [ii, blank], [iii, title-page], [iv, copyright], [v, Contents], [vi, blank], 228, [4, advertisements], [4, publisher's advertisements], xii pp. Original publisher's printed wrappers. Scattered foxing, slightly stained, spine split, split on upper cover near spine skillfully repaired. Housed in a brown buckram chemise within a red morocco slipcase. The Litchfield copy. BAL 16146. Grolier American 55. Heartman and Canny (1943), pp. 90-97. Queen's Quorum 1. Robertson pp. 51-52. POE, Edgar Allan. The Raven and Other Poems. New York: Wiley and Putnam, 1845. First edition, first printing. Octavo (189 x 135 mm). [i, half-title], [ii, blank], [iii, title-page], [iv, copyright notice with imprint of T.B. Smith, Stereotyper / 216 William Street], [v, Dedication], [vi, blank], [vii, Preface], [viii, TOC], 91, [4, advertisements] pp. Original publisher's printed wrappers. Miinor foxing to a few leaves, wrappers with a few tears at spine edges, minor edge wear. Housed in a chemise within a half blue morocco slipcase. BAL 16147. Heartman and Canny pp.. 97-108. Robertson (1934), pp. 53-54. Allen, Isafel 667. POE, Edgar Allan. Tales of the Grotesque and Arabesque. Philadelphia: Lea and Blanchard, 1840. 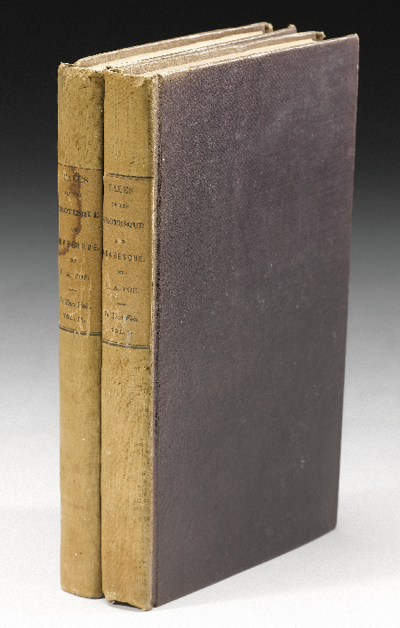 First edition of the author's first collection of stories, with intermediate state of quire 20 in volume two, correct pagination of p. 213, and with the displaced i and hyphen on p. 219. Two twelvemo volumes (195 x 115 mm). 244, [4, adv.] pp; 228. Publisher's purple cloth, printed paper spine labels. Occasional light foxing, some very light damp-staining in upper margins of second half text block to volume two, spines uniformly faded to warm brown. Housed in matching chemises within full crimson buckram clamshell box. BAL 16133, Heartman and Canny, pp. 49-54. Roberson (1934), pp. 46-49.